Complete pan and frameless shower. Everything needed was in the box. Beautiful, simple and just right! In addition to dealing with Lowe's horrendous customer service and lack of commitment, although we ordered VG6051STCL48WL, we received VG6051STCL48WR. (A week later than promised.) No worries, though! We changed up our bathroom design and made it work. And it works beautifully! Super heavy glass panels, sharp metal accents. Solid base. Make sure to set with enough mortar! All in all, a perfect staple for the bathroom. Nice modern look, reasonably easy to install with a helper. Unfortunately glass door came chipped, Vigo won't replace. Bought this for a 1st floor bathroom/laundry room combo & am thoroughly satisfied with this unit. 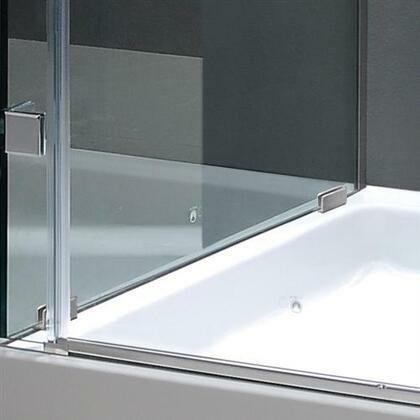 Having the glass wall plus the shower door gliding is really sharp & up-to-date with many of the high-end units out there. Plus being able to tile the other 2 walls with real tile versus the fiberglass option of some pre-packaged units really looks great. We tiled with porcelain tiles that look like travertine -- nice! Just make sure when installing you level & balance the door since it moves freely & can roll. This was well worth the cost! Not only does it look stunning, it is sturdy and easy to clean. Shipped and arrived in a timely manner. Excellent packaging. We were impressed with the quality of this shower enclosure. Would order from VIGO again! perfect choice for this bathroom! I bought this 2 months ago, have been using it for a month and am very satisfied with it.